Yes, Nancy Rink and Marcus Brothers did it again. Amazing array of colors you will find in this magnificent block of the month Painters Garden. This quilt is the pieced version. Painterly inspired prints of watercolor roses, wood planks, and spatters combine with interesting textures and motifs to create Nancy’s TWILIGHT TONES collection. The lush, trans-seasonal palette features shades of teal, berry and pear green, reminiscent of gardens depicted in the works of Impressionist artists. 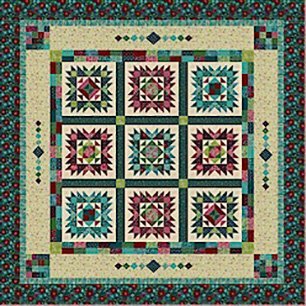 This block of the month included all fabrics for top including binding and pattern. Backing is not included. This is a 9 month program starting in March of 2018. Price per month is $ 24.50 plus shipping or all at once $ 220.25 free shipping.